Notizbl. Bot. Gart. Berlin-Dahlem 11: 611. 1932. TYPE: Panama. Col—n: dos Bocas, Río Falo Valley, 40-80 m elev., Pittier 4227 (US). Rosulate epiphyte; stems to 60 cm long, usually much shorter, ca. 1 cm diam. ; dense mass of greenish roots, acute and ascending at lips; cataphylls subcoriaceous, sometimes tinged with red, 5-10 cm long, drying medium brown, persisting ± intact. 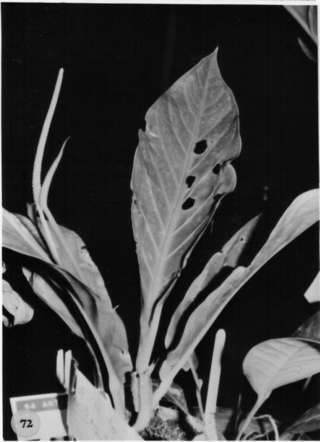 LEAVES erect-spreading; petioles quadrangular, sulcatc, 2.5-5(9.5) cm long, 5-7 mm wide; geniculum 7-10(20) mm long; blades oblong-oblanceolate, gradually acuminate at apex, acute at base, 24-83 cm long, 6-26 cm wide, broadest at middle or above; both surfaces semiglossy; midrib acutely raised above, square and prominently raised below; primary lateral veins 8-16 per side, departing midrib at 45° angle, arcuate-ascending, acutely raised above, raised and sometimes reddish below; submar-ginal collective vein arising in the apical quarter of blade, 2-9 mm from margin. 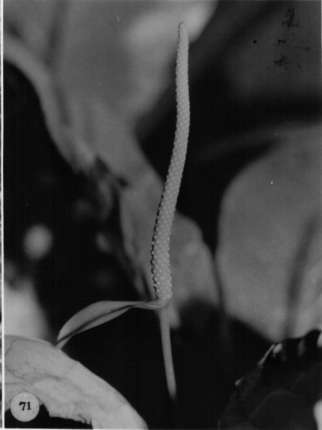 INFLORESCENCE erect-spreading to arching-pendent, shorter than or equalling leaves; peduncle 14-48 cm long, subterete, faintly ribbed; spathe pale green, sometimes tinged purplish, narrowly lanceolate, 5.5-9 cm long, 0.7-1.3 cm wide, narrowly long-acuminate to abruptly acuminate at apex, obtuse to subcordate at base; spadix pale reddish or green tinged reddish, 5-15 cm long, 4-8 mm diam. at base, 2.5-4 mm diam. at apex; flowers rhombic to weakly 4-lobed, 1.8-2.8 mm long, 2-3 mm wide, the sides straight parallel to principal spiral, gradually sigmoid on alternate sides; 5-9 flowers visible in the principal spiral and 5-12 flowers visible in the alternate spiral; tepals matte to weakly glossy, lateral tepals 1.2-1.5 mm wide, the inner margins straight to broadly rounded; pistils emergent 1-6 mm, pale green or while; stigma brushlike, ca. 0.5 mm long; stamens emerging in a slow progression from the base in a ± complete sequence, well exserted and held against sides ofexsented pistils; anthers white, 0.5-0.6 mm long, 0.5-0.8 mm wide; thecae broadly ovate; pollen white. INFRUCTESCENCE with spadix to 26 cm long; berries cream to greenish-yellow or orange, oblong-ovoid, 4-7 mm long, acute at apex. Figs. 71 and 72. The species is known from southern Costa Rica and Panama, occurring principally on the Caribbean slope from sea level to 1,000 m in wetter pans of tropical moist forest as well as in tropical wet, premontane wet and lower montane wet forest. It also occurs on the Pacific slope in the Fortuna area of Chiriquí Province. Anthurium fatoense is a member of section Pachyneurium and is considerably variable in the size of the leaves and inflorescences as well as in berry color. It is most easily confused with A. consobrinum in Costa Rica and is distinguished by its tapered, greenish spadix, which has the stamens emerged in a close cluster with the pistil not at all apparent. In the flowers of A. consobrinum, the pistil emerges well ahead of the stamens and dwarfs the stamens in size, extending several millimeters above the stamens. Despite the close vegetative resemblance of the two species, they are probably not closely related. Costa Rica :, 21 June 1986, Christenson 1560 (MO). Costa Rica Cartago:, 26 June 1979, Madison 6957 (MO, SEL). Costa Rica Cartago:, 1978, Madison 5515 (SEL). Costa Rica Lim—n: 0 m, 09.36.00N 82.36.30W, 27 January 1987, Michael Grayum, Bill McLarney & Fred Field 8018 (MO). Costa Rica Lim—n: 09.34N 82.56W, 27 June 1984, Barringer et al. 3554 (MO). Costa Rica Lim—n: 100-250 m,, 4 May 1983, Gomez et al. 20386 (CR, MO). Costa Rica Lim—n: Río Sixaola, 50 m,, 12 Aug 1977, Thomas B. Croat 43295 (MO). Costa Rica Lim—n: 70 m,, 11 Aug. 1977, Thomas B. Croat 43197 (MO). Costa Rica Lim—n: Caribbean Coast, 0-10 m, 09.53N 82.59W, 9-14 Feb 1977, Burger et al. 10485 (MO). Costa Rica Lim—n: 10 m, 9.34.45N 82.36.20W, 24 Mar. 1995, Herrera, G. 7549 (CR, MO). Costa Rica Lim—n: 1200 - 1300 m, 09.45N 083.19W, 16 Aug. 1995, Grayum, M.H. 11026 (CR, INB, MO, WU). Costa Rica Lim—n: Cordillera de Talamanca, 1100-1150 m, 09.46.30N 83.20.00W, 13 Aug 1995, Grayum 10927 (INB, MO). Costa Rica Puntarenas: Canton of Coto Brus, 1200 m, 08.49N 82.58W, 6-7 March 1984, Croat 57229 (CR, MO). Panama Bocas del Toro: Fortuna Dam Area, 600 m, 8.47N 82.12W, 12 March 1985, Hampshire & Whitefoord 484 (BM). Panama Bocas del Toro: Fortuna Dam Area, 310 m, 8.45N 82.10W, 9 March 1985, Croat & Grayum 60121 (K, MO, RSA). Panama Bocas del Toro: Fortuna Dam Area, 700 m, 8.45N 82.15W, 10 March 1985, Croat & Grayum 60256 (MO, RSA). Panama Bocas del Toro: 910 m, 8.44N 82.17W, 12 March 1985, Croat & Grayum 60423 (B, K, MO, RSA, US). Panama Bocas del Toro: 300-500 m,, 13 Dec. 1979, António 3147 (MO). Panama Bocas del Toro: 850 m, 08.48N 82.13W, 29 March 1993, Thomas B. Croat 74928 (MO). Panama Bocas del Toro: 120 m, 8.55N 82.10W, 5 March 1986, Gordon McPherson 8587 (MO). Panama Bocas del Toro: Cerro Banyic, 170-400 m,, 13 Apr. 1968, Kirkbride & Duke 606 (MO). Panama Bocas del Toro: Fortuna Dam Area,, 20 June 1973, Kennedy 3266 (F, MO). Panama Bocas del Toro: Chiriquí Lagoon,, 26 Apr. 1941, von Wedel 2350 (MO). Panama Bocas del Toro: Río Guarumo,, 5-7 June 1967, Lewis et al. 2051 (MO). Panama Bocas del Toro: Fortuna Dam Area, 1000 m, 8.48N 82.12W, 9 Feb. 1984, H.W. Churchill, G. de Nevers & H. Stockwell 4942 (MO). Panama Bocas del Toro: Fortuna Dam Area, 1000 m, 8.48N 82.12W, 5 Feb. 1984, H.W. Churchill, G. de Nevers & H. Stockwell 4635 (MO). Panama Bocas del Toro: 770-790 m, 08.45N 82.17W, 26 June 1994, Thomas B. Croat & Guanghua Zhu 76466 . Panama Chiriquí: Fortuna Dam Area, 1200-1600 m,, 12 September 1977, Folsom et al. 5293 (MO). Panama Chiriquí: Fortuna Dam Area, 1400 m,, 27 November 1979, Thomas B. Croat 48716 (FTG, MO). Panama Chiriquí: Fortuna Dam Area, 1260 m, 8.45N 82.17W, 10 April 1980, Thomas B. Croat 50095 (MO, W). Panama Chiriquí: Fortuna Dam Area, 1370 m, 8.43N 82.15W, 9 April 1980, Thomas B. Croat 49893 (FTG, MISSA, MO). Panama Chiriquí: Fortuna Dam Area, 1470 m,, 12 July 1980, António 5175 (MO). Panama Chiriquí: Vivero Forestal de Boquete, 1100-1200 m, 8.43N 82.14W, 17 June 1982, Knapp & Vodicka 5517 (MO). Panama Chiriquí: 1225 m, 8.45N 82.14W, 19 Sept. 1987, Thomas B. Croat 67794 (MO). Panama Chiriquí: Fortuna Dam Area, 1100-1200 m, 8.45.00N 82.15.00W, 27 Apr 1988, Thompson 5029 (CM). Panama Chiriquí: La Fortuna Dam area,, 30 Oct. 1991, Ingram 1177 (MO). Panama Chiriquí: Fortuna Road, 1100 m, 8.45.4N 82.15.4W, 8 February 1987, Gordon McPherson 10407 (MO). Panama Chiriquí:, 14 September 1993, D.W. Roubik, S. Bark & L. Quiroz 1232 . Panama CoclŽ: El Copé Region, 750-800 m, 8.40N 80.36W, 13 Feb. 1982, Knapp & Dressler 3501 (B, MO). Panama CoclŽ: 800-900 m, 8.45N 80.25W, 7 Nov. 1981, Knapp 1961 (MO). Panama CoclŽ: Cerro Tute,, , António 2055 (MO). Panama CoclŽ: 89.39N 80.36W, 23 June 1988, Thomas B. Croat 68810 (MO). Panama CoclŽ: El Copé Region, 600-800 m,, 12 May 1977, Folsom 3183 (MO). Panama CoclŽ: El Copé Region,, 5 Apr. 1978, Hammel 2420 (MO). Panama CoclŽ: El Copé Region,, , Hammel 2441 (MO). Panama CoclŽ: El Valle Region, 860-900 m,, 21 July 1976, Thomas B. Croat 37347 (MO, SEL). Panama CoclŽ: El Valle Region, 700 m,, 2 July 1978, Hammel 3902 (MO). Panama CoclŽ: 400 m,, July 1979, António 1358 (MO). Panama CoclŽ: 600 m,, 28 Jan. 1980, António 3598 (MO). Panama CoclŽ: 550 m,, 7 Dec. 1979, Thomas B. Croat 49220 (MO). Panama CoclŽ: 1530 m,, , D'Arcy & Sytsma 14690 (MO). Panama CoclŽ: 230 m,, 6 March 1978, Hammel 1808 (MO). Panama CoclŽ: 170-330 m,, 8 March 1978, Hammel 1908 (MO). Panama CoclŽ: 500 m,, 20 June 1978, Hammel 3483 (MO, SEL). Panama CoclŽ: 500 m,, 9 Apr. 1981, Sytsma 3880 (MO, PMA). Panama CoclŽ: 500 m,, 20 Feb. 1978, Hammel 1619 (MO). Panama CoclŽ: 200 m, 9.47N 80.28W, 9 Dec. 1983, H.W. Churchill, A. Lier, W.S. Armbruster & A. Herzig 3994 (MO). Panama CoclŽ: 200 m, 8.47N 80.28W, 17 Dec. 1983, H.W. Churchill, A. Lier, W.S. Armbruster & A. Herzig 4165 (MO). Panama CoclŽ: 860 m, 08.37N 80.08W, 7 July 1994, Thomas B. Croat & Guanghua Zhu 76733 (AAU, MEXU, MO). Panama Col—n: Río Tato, 40-80 m,, 16 Aug. 1911, Pittier 4227 (US). Panama Col—n: Portobelo Region, 50 m, 9.30N 79.40W, 28 Feb. 1986, Gordon McPherson 8513 (MO). Panama Col—n: Río Boqueron headwaters, 170 m,, 21 July 1978, Hammel 3947 (MO). Panama Col—n: Portobelo Region, 170 m,, 26 Apr. 1978, Hammel 2661 (MO, SEL). Panama Col—n: Portobelo Region,, , Thomas B. Croat 33649 (MO, PMA). Panama Col—n: 100 m,, 25 Aug. 1978, Hammel 4549 (MO). Panama Veraguas: Santa Fe Region, 1050-1150 m,, 29 Nov. 1979, António 2910 (MO). Panama Veraguas: 30-200 m,, 17 Oct. 1978, Hammel 5192 (MO). Panama Veraguas: Santa Fe Region, 950-1250 m, 8.36N 81.6W, 15 Dec. 1981, Knapp & Systma 2623 (MO). Panama Veraguas: Santa Fe Region, 800-1100 m, 8.35N 81.05W, 15 July 1983, C. Hamilton & K. Krager 3965 (MO). Panama Veraguas: Santa Fe Region, 1000-1250 m,, 30 Nov. 1979, Thomas B. Croat 48940 (MO). Panama Veraguas: Santa Fe Region, 1000-1030 m,, 4 Jan. 1981, Sytsma & António 3049 (MO). Panama Veraguas: Santa Fe Region, 1000-1030 m,, 4 Jan. 1981, Sytsma & António 3068 (K, MO). Panama Veraguas: Santa Fe Region, 900-1200 m,, 14 May 1981, Sytsma & Andersson 4658 (MO). Panama Veraguas: Santa Fe Region,, 4 Apr. 1980, António 4039 (MO). Panama Veraguas: Santa Fe Region, 730-770 m,, 26 July 1974, Thomas B. Croat 25941 (MO). Panama Veraguas: Santa Fe Region, 350-400 m,, 29 Aug. 1974, Thomas B. Croat 27365 (MO). Panama Veraguas: Santa Fe Region, 450-550 m,, 31 Aug. 1974, Thomas B. Croat 27583 (MO). Panama Veraguas: Santa Fe Region, 450-550 m,, 31 Aug. 1974, Thomas B. Croat 27749 (MO). Panama Veraguas: Santa Fe Region, 700-1200 m,, 18-19 March 1973, Thomas B. Croat 23115 (MO). Panama Veraguas: Santa Fe Region,, 5 May 1977, Folsom 2949 (MO, PMA). Panama Veraguas: Santa Fe Region, 500-1000 m,, 12 Dec 1971, Al Gentry 2953 (MO). Panama Veraguas: Santa Fe Region,, 17 Oct. 1974, Mori & Kallunki 2560 (MO). Panama Veraguas: Santa Fe Region, 970 m,, 17 Feb. 1974, Nee 9807 (MO). Panama Veraguas: Santa Fe Region, 970 m,, 13 Apr. 1974, Nee 11220 (MO, PMA). Panama Veraguas: Santa Fe Region, 735 m,, 4 Apr. 1976, Croat & Folsom 34124 (B,CAS,COL,CR,DUKE,F,MBM,MEXU,MO,NY,PMA,RSA,US). Panama Veraguas: Santa Fe Region, 480 m, 8.33N 81.08W, 28 June 1987, Croat 66940 (MO). Colombia Narino: La Planada, 1700 m, 1.06N 77.53W, 10 March 1990, Thomas B. Croat 48705 (F, DUKE, MO, NY, RSA, S, US).